What are Kratom Pills and how do they compare to kratom powder & tea? Most commonally call Kratom Capsules, the pills consist of kratom powder put into a geletan or veggie-capsule. There’s different sizes on the market but the most common is size 00 since they can still hold roughly 600mg yet are small enough to use even for people who have trouble with pills. This form of kratom has become very popular over the years because they are the easiest and most convenient way to use and gain benefit from the kratom leaf. There’s a lot of good about powder or tea, many, many people use kratom this way however there are downsides to these methods and pills (capsules) take care of some if not most of those issues. One being taste, kratom has a highly potent, earthy and bitter taste. Some don’t mind it in the least but others would rather not use kratom if they have to taste it everytime they use it. There are ways to hide the taste of powder like mixing it in a drink however if you don’t like the taste of kratom it probably won’t help immensely. Pills though make kratom very easy to take with virtually no taste at all. Tea is another way many people use kratom, sometimes it’s nice to just kick back with a good cup of tea. Here again though there is a very possible taste issue but tea of course takes a good amount of time to prepare, it’s not hard, it doesn’t take hours but it does take time. There’s also the clean up afterward. So if you’re not really into tea you may rarely get to actually using and benefiting from your kratom. Kratom pills take care of this issue as well because you can use them anytime and anywhere you have a drink of water. They are premeasured and premade so there’s absolutely nothing extra you have to do to enjoy your kratom. Although pills are by far the easiest way to use kratom there are a couple downsides. One is the cost, capsules are about 10-30% more expensive than loose powder or crushed leaf depending where you buy them. This is due to extra labor, machinery, and the capsules themselves. You can buy a capsule machine and empty capsules to make your own however this can become very time consuming depending how much you use. The next possible problem is the amount of capsules you might need to take. Like I mentioned before most pills are about 600mg each, most good kratom is active at just 2 grams so that’s only 3-4 pills per use. But depending on how much you need personally that amount could be considerably higher. It’s worth taking into account if you’re not big on pills to begin with. 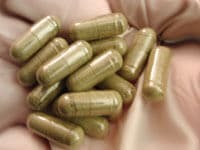 The other issue with capsules, although minor, is they can take about 10-30 minutes extra before you start to notice the effects of the kratom. Drinking more water will help with this though and keep it more in the 10 minute range instead of 30. If that’s the case it should only take 20-30 minutes total for the pills to start working. For most people this is in no way a deal breaker but I though I would at least mention it. Anyone who dislikes the bitterness and possible mess of loose kratom, doesn’t want to prepare it everytime, anyone who wants premeasured amounts and wants the option of taking their kratom anywhere and anytime easily. If you want your kratom absolutely hassle free, there’s no question, kratom pills (kratom capsules) are the way go.